When most people think about marine life in Monterey Bay, they think of large animals such as whales, sea lions, and pelicans. But none of these charismatic creatures would be here if not for millions of smaller animals such as anchovies and krill. Unfortunately, such “forage animals” are not easy to study. It’s relatively easy to track a whale, but tracking groups of small animals is challenging, especially when they are far below the surface. Over the last decade, MBARI Senior Scientist Kelly Benoit-Bird has been doing just this, using advanced echo sounders mounted on boats and underwater robots. 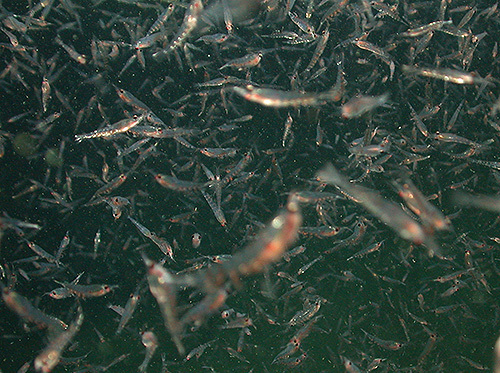 She and her colleagues recently published a paper in Geophysical Research Letters that reveals unexpected schooling behavior by anchovies and krill—key forage animals in Monterey Bay. From March to October 2017, Benoit-Bird and Research Specialist Chad Waluk mapped the vertical and horizontal distribution of forage animals in Monterey Bay on an almost daily basis. Using sonar data from the echo-sounder, they were able to figure out the density and types of animals between Moss Landing and the middle of the bay. They also used MBARI’s remotely operated vehicle (ROV) Ventana to shoot underwater video that confirmed what types of animals were showing up in their sonar plots. Looking at their data, the researchers were surprised to discover huge variations in the how tightly the animals packed together from one day to the next. One day the anchovies and krill formed dense schools and swarms. The next day they would be widely dispersed. To find out what might be driving these day-to-day variations, Benoit-Bird and Waluk worked with MBARI Biological Oceanographer John Ryan. After looking at data on winds, tides, water temperatures, and the water chemistry of the bay, the researchers found that the schooling behavior on any given day correlated closely with something called the regional upwelling index. The regional upwelling index, in turn, depends on the strength of northerly winds blowing over the open ocean near Monterey Bay. More specifically, the researchers discovered that, on days when the upwelling index was high (the wind was blowing strongly from the northwest), anchovies and krill formed dense schools or swarms. But on days when the upwelling index was low (typically when the wind was light or blowing from the south) the animals would be widely dispersed. At first glance it might seem surprising that anchovies and krill, tens to hundreds of meters below the ocean surface, would respond to changes in the wind. But it turns out that much of the marine life in Monterey Bay depends on northwest winds and upwelling. When the northwest winds blow hard, typically in spring and summer, they push the surface waters offshore, allowing cold, nutrient-rich water to rise up (upwell) to the surface along the open coast. This nutrient-rich water acts like fertilizer for microscopic marine algae such as diatoms, which reproduce rapidly, and provide food for small fish and krill. In short, there is a connection between wind and anchovies because wind creates upwelling, which provides food for algae, which in turn provide food for krill and other animals. But these processes typically take several days or even weeks. Yet the forage animals in Benoit-Bird’s study were responding to changes in upwelling within just a single day. 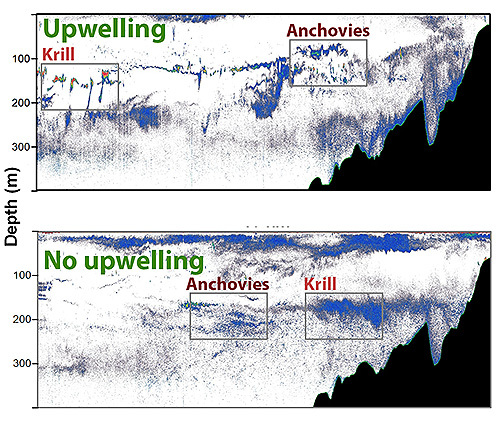 So the researchers are still trying to figure out why both anchovies and krill would react so similarly, and so quickly, to changes in upwelling. 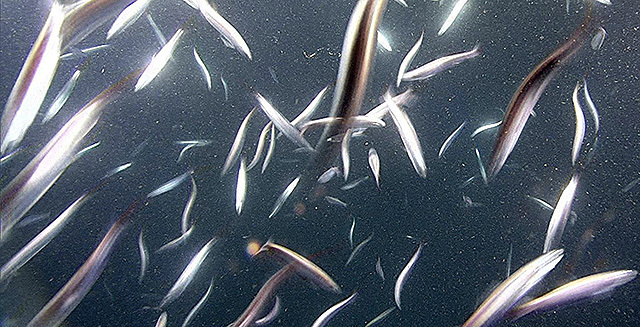 The researchers suggest that the rapid, day-to-day changes in schooling behavior indicate that krill and anchovies are actively swimming closer together rather than being passively swept together by currents. This, in turn, implies that the animals are sensing changes in their environment and reacting in response to these changes. However, the animals do not seem to be sensing changes in the temperature or salinity of the water around them, since these variables did not correspond with changes in schooling behavior. It is possible that the anchovies and krill bunch together because they are being attacked more vigorously by predators on days with stronger upwelling. However, many predators, such as whales, need to find dense patches of food in order to survive. So it might be that the predators are responding to the schooling behavior of prey instead of the other way around. The researchers hope to test these hypotheses in future studies. Benoit-Bird is also hoping to use MBARI’s underwater robots to look at differences in schooling behavior at different times of day. Many animals, including krill, migrate up toward the ocean surface at night. Marine biologists have assumed that this allows the migrating animals to find more food while reducing the chance of being eaten by day-time predators. She is currently installing echo sounders on one of MBARI’s long-range autonomous underwater vehicles, which could give her a long-term, 24-hour view of predators and prey in the bay.